……exploring Himalayan wonders on mountain bike and more different ways with heart and soul……..requires sense of adventure!!! 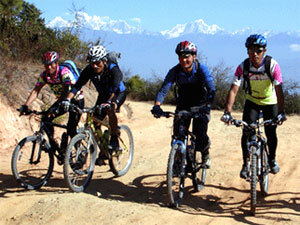 Kathmandu Valley Rim offers one of the best mountain biking destinations in Nepal which brings you some of the exhilarating ultimate views points - Kakani, Shivapuri Hill, Nagarkot, Dhulikhel and Lakuri Bhanjyang are the main along the journey. The amazing views of pristine snow clad mountains and top to bottom colorful ethnical cultural activities of locals of around makes the mountain biking trip unforgettable. The valley Rim is also well known bird watching spot and protected water shade & wild life reserve. Day 03: Drive to Balaju Bypass by private Jeep and warm up bike ride to Kakani and overnight at basic teahouse lodge.